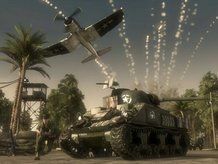 The Xbox community has picked up the kudos in the Battlefield 1943 race to 43 million kills, unlocking the extra map offered for reching the total within five days, well ahead of the rival PS3 community. EA's cheeky publicity stunt of pitting the two consoles against each other in the budget BF1943 stakes has certainly aided the game's popularity – as the race to unlock Coral Sea was lapped up by gamers. And it is the Xbox community that hit the landmark first, with James (jkasapi) from Peterborough that registered that 43 millionth kill, and opening the new map in just five days. An air of superiority, you say? "Coral Sea is designed to showcase the intense battle in the skies, offering an all-new Air superiority game mode," explains developers DICE. "The legendary WWII action this map provides will have players dog fighting in this airplanes-only map." And for those who still care, the number of kills on each console can still be tracked on the www.battlefield1943.com website.